Hatful of Hollow is a compilation album by English rock band the Smiths. Released on 12 November 1984 by the band's British record company Rough Trade, the album reached No. 7 on the UK Albums Chart and stayed on the chart for 46 weeks. It was released on 9 November 1993 by their American label Sire Records, which had initially declined to release the album. Sire instead released Louder Than Bombs in the US in 1987—which contains several of the same tracks as Hatful of Hollow—as well as The World Won't Listen. It features BBC Radio 1 studio recordings and two contemporary singles with their B-sides. In 2000, Q magazine placed Hatful of Hollow at number 44 in its list of the 100 Greatest British Albums Ever. The current sleeve for Hatful of Hollow is the CD issue sleeve, featuring a cropped photograph of the otherwise unknown Fabrice Colette taken by Gilles Decroix. The original sleeve, pictured above, included a tattoo of a Cocteau drawing on Colette's left shoulder, which he had had done in June 1983 because he idolised Cocteau. The photograph is taken from a July 1983 special edition of the French newspaper Libération. Additionally, the old cover had a large sky-blue frame with the legends "The Smiths" and "Hatful of Hollow" above and underneath the picture. All editions after 1987 however feature the cropped version with the text superimposed. The 2011 vinyl re-issue reinstated the original sleeve. The album consists mainly of songs recorded over several BBC Radio 1 sessions in 1983 (tracks shown in bold were included on the album). When first broadcast, these radio sessions mainly featured songs which were otherwise unavailable—all were subsequently re-recorded for singles or for the following year's debut album. "This Night Has Opened My Eyes" was recorded in the studio in June 1984, but the only version ever released was the September Peel session. For David Jensen on 4 July 1983: "These Things Take Time", "You've Got Everything Now", "Wonderful Woman"
For Jensen on 5 September 1983: "Accept Yourself", "I Don't Owe You Anything", "Pretty Girls Make Graves", "Reel Around the Fountain"
For Peel on 21 September 1983: "This Charming Man", "Back to the Old House", "This Night Has Opened My Eyes", "Still Ill"
The album also features the band's debut single, "Hand in Glove", and their two most recent singles prior to the album's release, "Heaven Knows I'm Miserable Now" and "William, It Was Really Nothing", with their B-sides "Girl Afraid", "How Soon Is Now?" and "Please, Please, Please Let Me Get What I Want". "How Soon Is Now?" would receive a separate single release in 1985 in the United Kingdom and the United States. It reached No. 24 in the British charts, but failed to chart in the US. Morrissey and Johnny Marr lamented the lack of chart success of what they considered their strongest song thus far. "How Soon is Now?" was also featured on the soundtrack to the 1986 film Out of Bounds, but wasn't included on the accompanying soundtrack album. "What Difference Does It Make?" has heavier and more natural-sounding guitars than the version on The Smiths. It is also in a higher key than the version on The Smiths. "These Things Take Time" features bass that is more prominent and drums that are less controlled than in the version from the "What Difference Does It Make?" 12" single. Sliding guitar figures accompany the chorus. "This Charming Man" has softer and more upbeat vocals, guitars and even drums than the version released as a single and on some versions of The Smiths. The bass line is louder and altered slightly. Additionally, there is no solo guitar introduction. "Hand in Glove" is the version that appeared on the original single, not the one on The Smiths. It features a fade-intro, louder bass, and vocals that sound very distant. "Still Ill" opens and closes with a harmonica solo, and sounds less hollow and slightly slower than the version on The Smiths. "You've Got Everything Now" is slower than the version on The Smiths and does not have any keyboard part. The bass line is also altered slightly. "Back to the Old House" (originally the B-side to "What Difference Does It Make?") is an acoustic piece with melancholic guitars and vocals. "Reel Around the Fountain" has duller-sounding drums and acoustic guitars than the version on The Smiths. The bass is more prominent, but the piano and organ parts are not included. It is also in a higher key than the version on The Smiths. All tracks written by Morrissey/Marr. Tracks marked with an asterisk (*) were first released on this compilation. "THE IMPOTENCE OF ERNEST" is etched on Side A, beginning with "William it Was Really Nothing". As well as being a pun on The Importance of Being Earnest, it is an allusion to the impotence that Ernest Hemingway suffered in his final years. "Ian (EIRE)", etched on Side B, refers to Johnny Marr's younger brother. Johnny Marr – guitars, harmonica, mandolin, slide guitar on "How Soon is Now?" John Porter – electronic percussion on "How Soon Is Now?" ^ Erlewine, Stephen Thomas. "Hatful of Hollow – The Smiths". AllMusic. Retrieved 25 September 2015. ^ Kot, Greg (7 July 1991). "The Smiths And Solo". Chicago Tribune. Retrieved 10 November 2015. ^ Wolk, Douglas (18 November 2011). "The Smiths: The Smiths Complete". Pitchfork. Retrieved 25 September 2015. 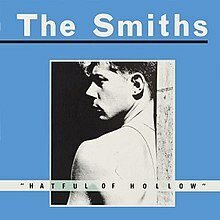 ^ "The Smiths: Hatful of Hollow". Q (87): 139. December 1993. ^ Sheffield, Rob (2004). "The Smiths". In Brackett, Nathan; Hoard, Christian. The New Rolling Stone Album Guide (4th ed.). Simon & Schuster. pp. 753–54. ISBN 0-7432-0169-8. ^ Harrison, Andrew (May 1993). "The Smiths". Select (35): 104. ^ Black, Bill (17 November 1984). "It's a Fair Cap!". Sounds. ^ Dalton, Stephen (1998). "The Smiths: Hatful of Hollow". Uncut. ^ Cavanagh, D, 1993. Irreproachable: The Smiths: the very best of British?. Q Magazine, 1 December 1993. ^ Fletcher, T, 2012. A Light That Never Goes Out: The Enduring Saga of the Smiths. 1st ed. U.K.: Random House. p. 355. ^ "SMITHS | Artist". Official Charts Company. Retrieved 30 August 2017.